Through their foundation and philanthropic work, Pau and Marc Gasol provide opportunities for health and wellness to children and adolescents from low income families and neighborhoods. With their sixth installment of the Pau Gasol Academy by Santander Grants, the foundation will present a grant geared towards minors from families with limited financial resources. Through creative and interactive workshops, Gasol Foundation teaches its members about the importance of the four key pillars necessary for a healthy lifestyle: healthy eating, physical activity and sport, quality and duration of sleep, and emotional well-being. Gasol Foundation was founded in 2013 by NBA All-Star athletes Pau and Marc Gasol. The Gasol brothers started their foundation with a clear vision in mind- a world in which all boys and girls will enter adulthood physically and mentally equipped to live fruitful and healthy lives, full of opportunities. Pau and Marc both wanted healthy resources readily available for all families, no matter their socioeconomic status or background. Gasol Foundation is constantly working on new ideas and initiatives in order to accomplish this. With that being said, we could not be more proud to announce that the Pau Gasol Academy by Santander Grants has returned for its third consecutive year. Our goal with this initiative is to offer children from low income families, ages 8 to 17, the opportunity to participate in the official Pau Gasol basketball camp. Here, they will not only be able to learn basketball fundamentals and improve their game, but also learn about healthy tips and other lessons that can be applied off the court as well. In order to be eligible for this scholarship, children must have good academic and social standing, along with various other individual requirements. Additionally, they will be asked to provide information regarding their parent’s household, economic, and career status. The applicants that meet all of the requirements will then be up for consideration for the scholarship offer. The complete bases of the 2019 Pau Gasol Academy by Santander scholarships can be found here. The Pau Gasol ACADEMY BY SANTANDER offers a 1- week training program ran by professional trainers, certified physical therapists, nutrition experts, and first class coaches. 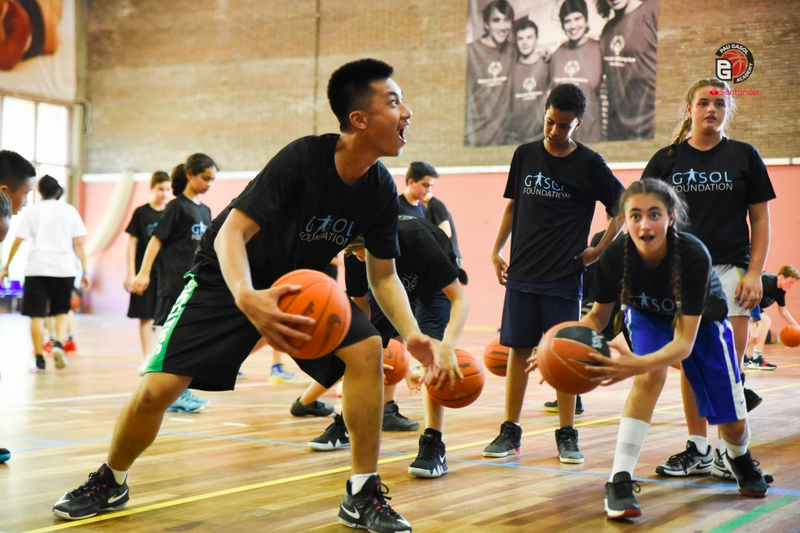 The Pau Gasol Academy stands out not only for its top-notch professionals and training, but also for its transversal teachings of healthy habits through the Gasol Foundation. Subjects such as hydration and the four pillars of health are just a few topics that will be discussed. Scholarship recipients will also learn about certain core values important to Pau himself, such as hard work, respect, effort, teamwork, friendship, and sportsmanship. After the program is completed, we hope that the participants maintain all the healthy information they have learned and continue to practice those habits on a daily basis. Our technical team at the academy will work to ensure that this happens. It is just as important that the families of the participants help sustain these practices in the home. In fact, it is the responsibility of society as a whole to help end this childhood obesity epidemic, an epidemic that already effects 2 out of 5 children in Spain. The implication, work and joint commitment of all individuals in society is crucial to prevent childhood obesity. According to data from the World Health Organization (WHO), childhood obesity is a serious public health issue that affects 42 million children worldwide. If this trend continues, this figure will nearly double to 70 million within the next 10 years. This is why Gasol Foundation has been working since 2013 to reverse this trend. Founded by Pau and Marc Gasol, the foundation works to reduce childhood obesity rates, and focuses all its time, energy, and resources to promote healthy lifestyle habits to children and their families. Particularly, the foundation emphasizes the importance of four main pillars of health: physical activity and sport, healthy eating, sleep quality and duration, and emotional well-being. 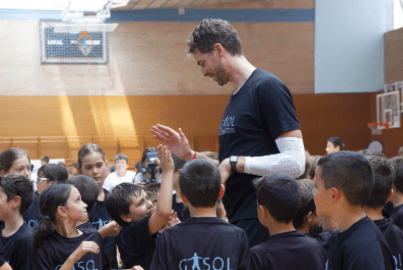 Gasol Foundation’s programs and initiatives throughout the United States and Spain are meant to improve the quality of life for children and their families through these healthy habits. We strive to be a leader in the field of childhood obesity and we feel as though our programs will allow us to do that. We will continue to perform high quality interventions and innovative research until our Zero Childhood Obesity mission is accomplished. Through the key involvement of family, educators, and community, we will continue to develop programs that promote children’s health and well-being. Numerous studies indicate that socioeconomic inequalities influence the risk of childhood obesity. These families generally have very little access to information and other helpful resources, thus enabling more challenges and difficulties for them to implement certain healthy habits. Gasol Foundation wants to play a significant role in changing this statistic. Under the slogan “Zero Childhood Obesity”, the Gasol Foundation’s objective is to provide a unique and interactive experiences for young people at risk of social exclusion.